I've always been interested in vampires. 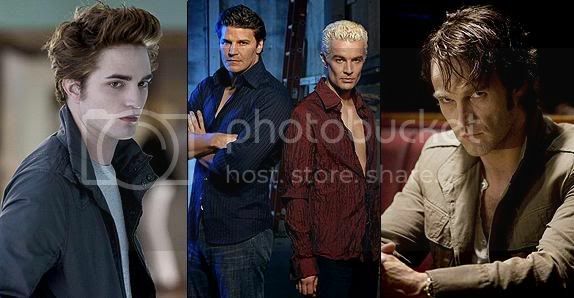 Empire Blog question the rise in vampire love (but apparently this all started with True Blood, Twilight, and Buffy... I argue this "vampire thing" isn't a "these days" phenomenon; it's been there for a looooong time, hollywood is just jumping on the bandwagon with dollar signs in their eyes). On that note, I just finished watching the pilot episode of 'The Vampire Diaries'. I read the books (there were four of them then) about 15 years ago... People have been drawing strong comparisons between these books and 'Twilight'. The TV show was completely Twilight-esque. Very teen. However, the soundtrack rocked (Bat for Lashes, White Lies just to name two tracks). Basic plot: Gorgeous yet tragic Elena (both parents lost to a car accident 5 months ago) is strangely attracted to the mysterious new boy at school, Stefan Salvatore. Yes, he is a vampire. Enter Damon Salvatore, Stefan's older and way more evil vampire brother... Elena is a dead-ringer for Katherine, a girl both (?) loved in 1870s... Let the drama begin!